After the first dances were complete (and some mingling and socializing had taken place), it was time for the cake cutting. I absolutely loved our wedding cake! 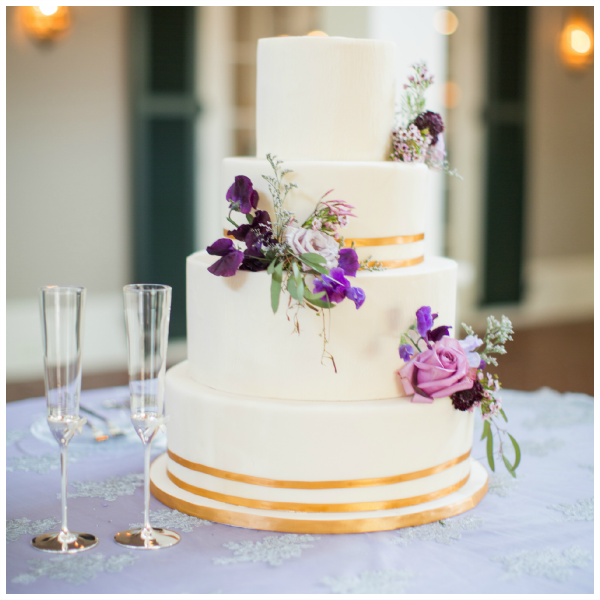 I wanted something simple yet elegant, and that is exactly what Gia from Gia's Cakes created for us. I'm not a huge fan of fake flowers on a wedding cake, so I requested that we have an understated cascade of real flowers towering down the cake. 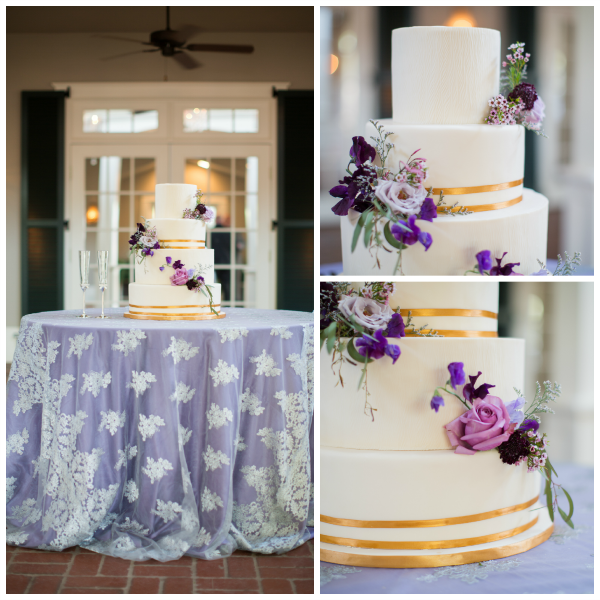 The beautiful flowers combined with the elegant gold borders around each layer made this cake everything and more that I had hoped for. Most importantly, it was the best wedding cake that I have ever tasted. Delicious! 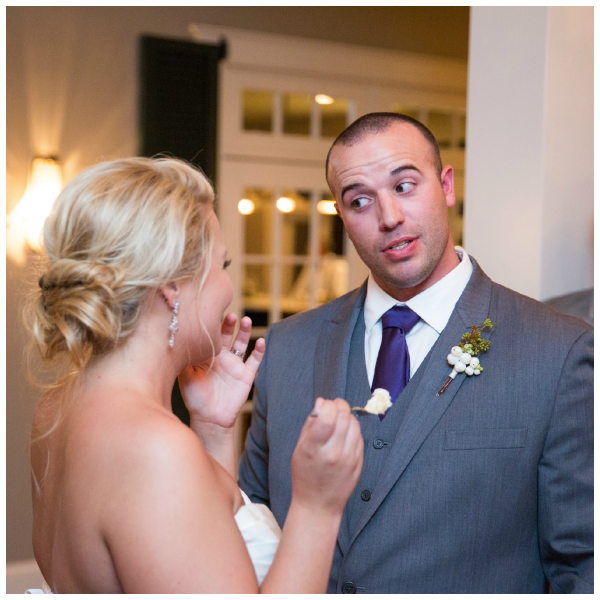 I warned Steven throughout our engagement that he had to be nice when he was fed me my piece of cake. 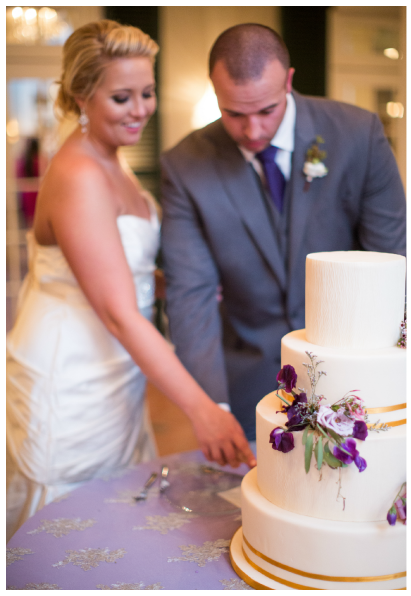 I didn't want to have to touch up my makeup or scrub wedding cake out of my dress after the cake cutting. I again warned him as he was putting the fork up to my face, and thankfully, he stuck to my wishes feeding me very gently. I, on the other hand, wasn't so nice. I figured well, he's already fed me my bite so what do I have to lose?! He could see it in my eyes that I wasn't going to play fair. After the bridal cake was cut, it was time for me to surprise my groom with his groom's cake. Since day one he had been very specific on what kind of groom's cake he wanted. He wanted a very bright and loud Tennessee cake (gross!). As much as it pained me to have to have anything Tennessee related at my wedding, I knew it was something he really wanted. I took his cake suggestions with me to the cake designer, but I didn't tell him what the cake would look like. 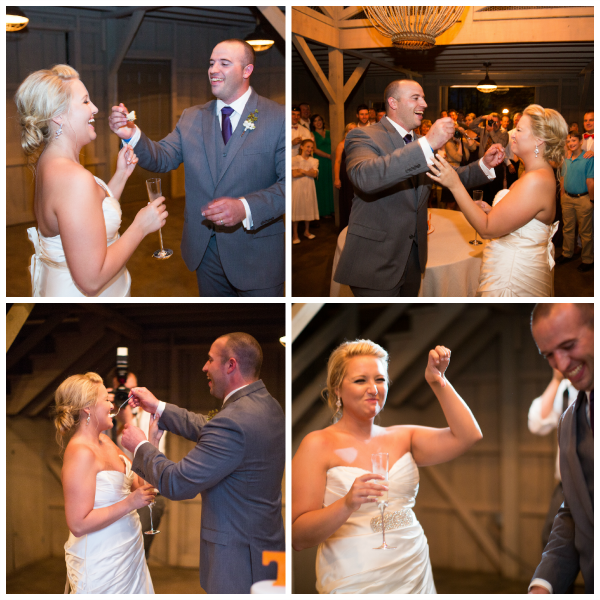 Even at the wedding, the cake was tucked away in the barn with the doors closed until it was time to reveal it. 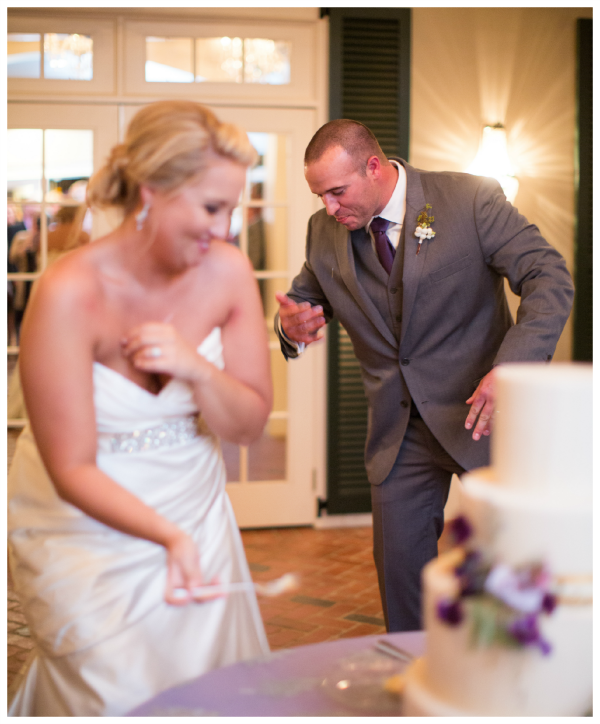 Needless to say, Steven loved his Tennessee groom's cake. I figured if we are going to do this horrible cake, we may as well go all out with it, including the inside of the cake. The inside mimicked the orange and white checkerboard that was designed on the outside of the cake. 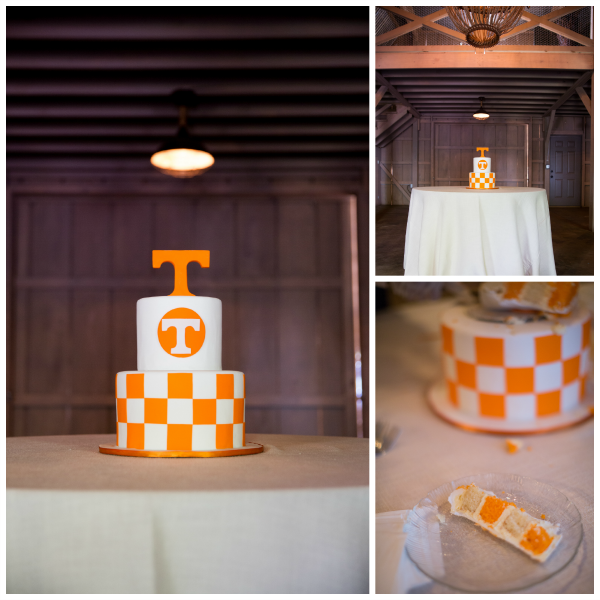 Being the Tennessee hater that I am, I had absolutely no desire to eat of piece of that cake. I mean, wasn't designing the horrible orange and white cake enough?! Obviously not. 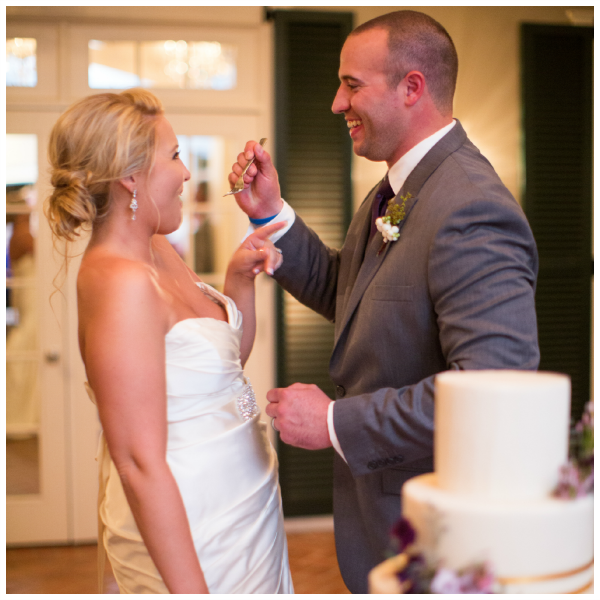 My new husband had every intention of feeding me a piece of that cake. You can see by my face that it wasn't an easy task. In the end however, I ate the cake. The lengths we go to for love! 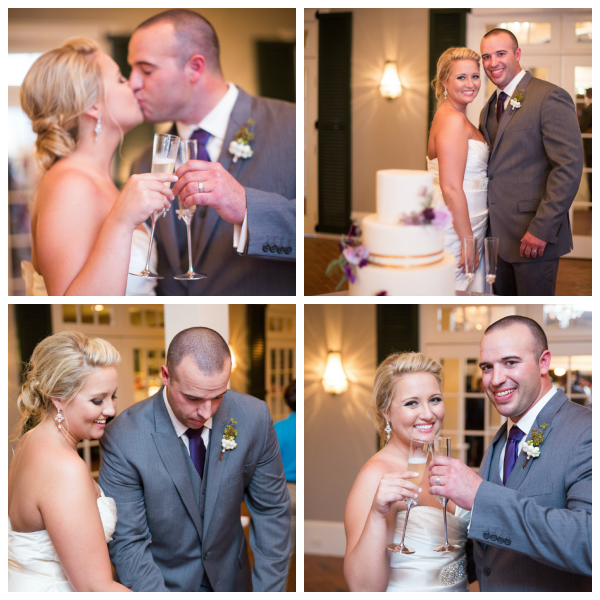 My husband was the one who said he didn't want to get cake all over him instead of me, ha! The Tennessee caked turned out good!! I love it! That cake is gorgeous. I love this! 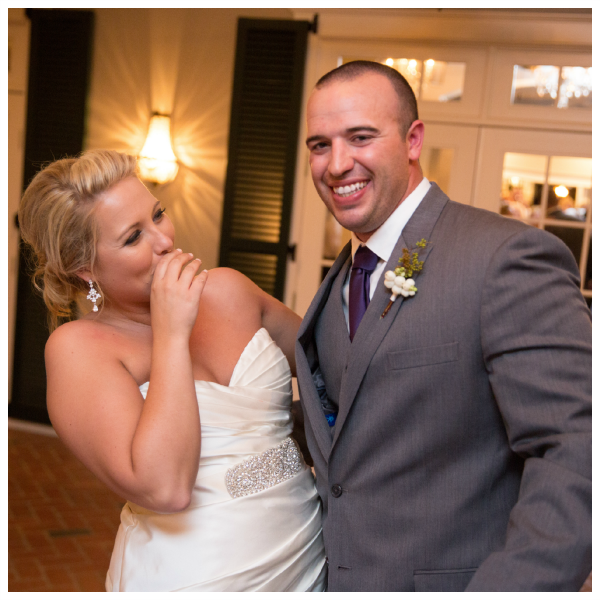 I totally shoved cake in Dan's face on our wedding but didn't want the same done to me :) I love that you surprised him with a grooms cake. This is one thing I wish I had surprised Dan with! I love simple, elegant cakes! Yours is perfect! Oh wow, your cake was gorgeous girl! Such a pretty cake! 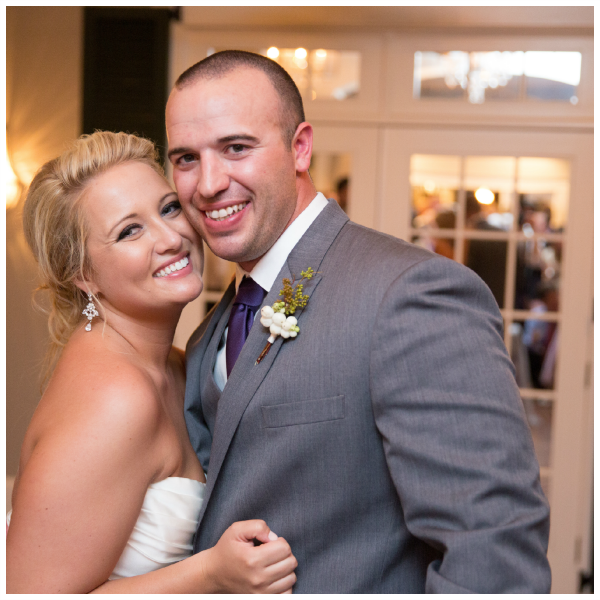 And the pictures of you two are so sweet! This is so hilarious. Jackson and I both agreed to be nice and at the last minute, we both had a change of heart. Cake was everywhere. hahaha. 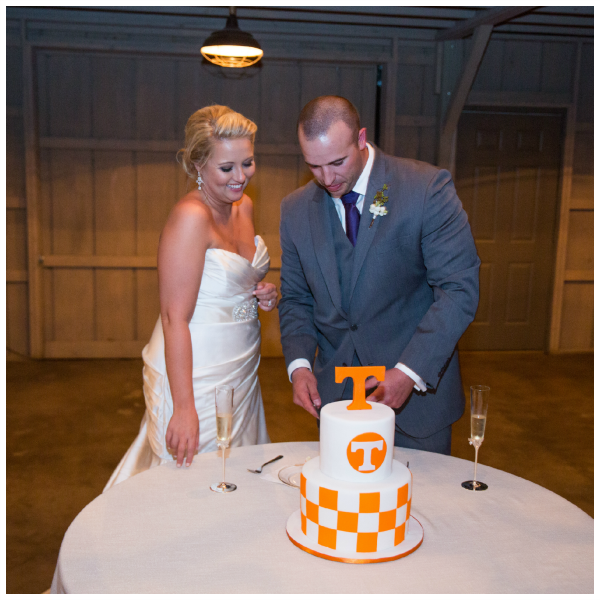 :) His cake is awesome (booo Tennessee, Vandy fan right here!!) and your cake was stunning!! I love the purple and gold!! What beautiful pictures! Love how playful y'all are with each other. What a beautiful cake! Looks yummy! That is a stunning cake! I also really like the lace overlay on the table! Congratulations on the wedding!! Love the cakes! Especially the cascading flowers! I love your main cake and that is so sweet you went all out for his!